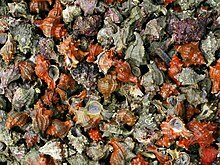 Muricidae is a large and varied taxonomic family of small to large predatory sea snails, marine gastropod mollusks, commonly known as murex snails or rock snails. With about 1,600 living species, the Muricidae represent almost 10% of the Neogastropoda. Additionally, 1,200 fossil species have been recognized. Numerous subfamilies are recognized, although experts disagree about the subfamily divisions and the definitions of the genera. Many muricids have unusual shells which are considered attractive by shell collectors and by interior designers. Muricid shells are variably shaped, generally with a raised spire and strong sculpture with spiral ridges and often axial varices (typically three or more varices on each whorl), also frequently bearing spines, tubercles, or blade-like processes. Periostracum is absent in this family. The aperture is variable in shape; it may be ovate to more or less contracted, with a well-marked anterior siphonal canal that may be very long. The shell's outer lip is often denticulated inside, sometimes with a tooth-like process on its margin. The columella is smoothish to weakly ridged. The operculum is corneous and of variable thickness, with the nucleus near the anterior end or at about midlength of the outer margin. Many muricids have episodic growth, which means their shells grow in spurts, remaining the same size for a while (during which time the varix develops) before rapidly growing to the next size stage. The result is the series of above mentioned varices on each whorl. Most species of muricids are carnivorous, active predators that feed on other gastropods, bivalves, and barnacles. The access to the soft parts of the prey is typically obtained by boring a hole through the shell by means of a softening secretion and the scraping action of the radula. Because of their carnivory, some species may be considered pests because they can cause considerable destruction both in exploited natural beds of bivalves, and in farmed areas of commercial bivalves. Muricids lay eggs in protective, corneous capsules, the size and shape of which vary by species. From these capsules the crawling juveniles, or more rarely planktonic larvae, hatch. Members of the genus were harvested by early Mediterranean peoples, with the Phoenicians possibly the first to do so, to extract an expensive, vivid, stable dye known as Tyrian purple, imperial purple, or royal purple. The family Muricidae first appears in the fossil record during the Aptian age of the Cretaceous period. ^ Merle, D., Garrigues, B. & Pointier, J.-P. (2011). Fossil and Recent Muricidae of the World, Part Muricinae. 648 pp., 182 colour plates, ConchBooks, Hackenheim. ISBN 978-3-939767-32-9. Houart, R. (1994). Illustrated Catalogue of Recent Species of Muricidae named since 1971. 181 pp. [incl. 28 pls. ], Verlag Christa Hemmen, Wiesbaden. ISBN 3-925919-19-8. Poutiers, J. M. (1998). Gastropods in: FAO Species Identification Guide for Fishery Purposes: The living marine resources of the Western Central Pacific Volume 1. Seaweeds, corals, bivalves and gastropods. Rome: FAO. page 553. Rosenberg, Gary (1992) The Encyclopedia of Seashells. New York: Dorset Press. Vaught, K.C. (1989) A Classification of the Living Mollusca. American Malacologists, Inc., Melbourne, Florida. Wikimedia Commons has media related to Muricidae. This page was last edited on 9 January 2019, at 14:21 (UTC).